We market high-quality games worldwide as publisher or co-publisher. Already boasting a successful track record that includes Machinarium, Tales of Monkey Island and Shadow Tactics: Blades of the Shogun, we take projects from conception to release and beyond. Together with our partners we help make innovative game concepts and promising projects a reality. Our years of experience make Daedalic an ideal global publishing-partner for online, offline and mobile games. Our internal development team designs and produces entertainment products in a reliable and competent manner, no matter the size. We develop original IPs and have successfully worked with licensing partners. Daedalic Entertainment develops for PC, Mac, consoles, browser as well as social and mobile platforms. Our successful masterpieces The Long Journey Home and The Pillars of the Earth have been released in 2017. Be excited for our upcoming games in 2018, like State of Mind! At the moment, we're not offering any kind of internships for school students. More information regarding our requirements are coming soon. 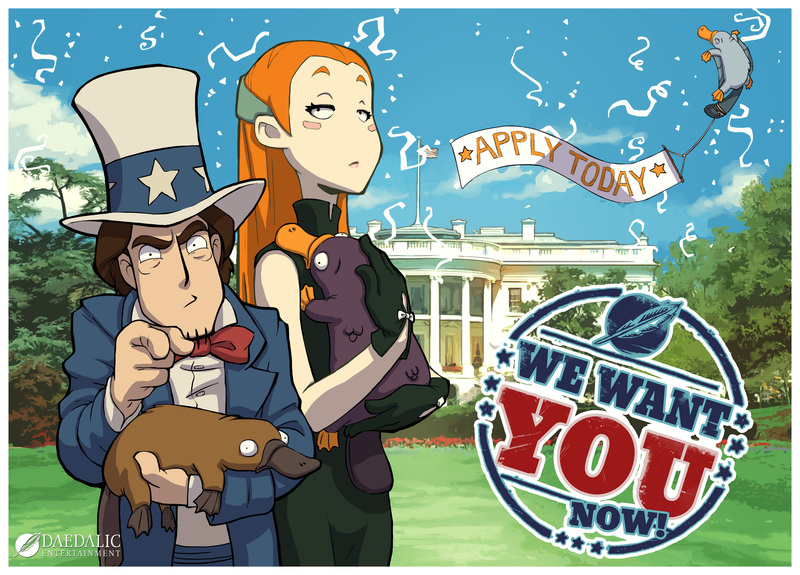 Please send your applications to jobs@daedalic.com. As an intern you have the special chance to be an active part in the varied daily business in the PR department of a video game developer and publisher. It’s very important for us to support our interns by offering a competent and friendly team. If you’re up for this challenge, want to learn new skills and execute your practical knowledge, feel free to apply. We’re looking forward to your application. Please send all your application files (cover letter, resume, certificates, work samples etc.) as a PDF file (max. 5 MB) via e-mail to jobs@daedalic.com (contact person: Iris Wolfer). Please add PR-1 for position reference. As an intern (m/f) in the PR & Social Media department you have the special opportunity to obtain a detailed insight in the daily PR & Social Media business of a video game developer and publisher. Emser Str. 9, 10719 Berlin. Darüber hinaus setzen wir ebenfalls zur Optimierung der Benutzerfreundlichkeit temporäre Cookies ein, die für einen bestimmten festgelegten Zeitraum auf Ihrem Endgerät gespeichert werden. Besuchen Sie unsere Seite erneut, um unsere Dienste in Anspruch zu nehmen, wird automatisch erkannt, dass Sie bereits bei uns waren und welche Eingaben und Einstellungen sie getätigt haben, um diese nicht noch einmal eingeben zu müssen. Die durch Cookies verarbeiteten Daten sind für die genannten Zwecke zur Wahrung unserer berechtigten Interessen sowie der Dritter nach Art. 6 Abs. 1 S. 1 lit. f DSGVO erforderlich. Die meisten Browser akzeptieren Cookies automatisch. Sie können Ihren Browser jedoch so konfigurieren, dass keine Cookies auf Ihrem Computer gespeichert werden oder stets ein Hinweis erscheint, bevor ein neuer Cookie angelegt wird. Die vollständige Deaktivierung von Cookies kann jedoch dazu führen, dass Sie nicht alle Funktionen unserer Website nutzen können. Our content has been created with care, but we're not responsible for the accuracy, completeness and topicality. As a service provider, we're responsible for the content on this website according to ß § 6 section 1 MDStV and § 8 section 1 TDG. Service providers are not responsible to watch over external information or to check if the information & actions are legal. The engagement of removing or locking the used information stays unaffected after the general law. Our liability is only valid after the knowledge of an illegal action or information. As soon as we know about illegal content, we will remove it immediately. We provide links to external and third-party websites which have their own content where we don't have any influence on. Therefore we're not responsible for content on these websites. The owner or provider of these websites is fully responsible for the displayed content. At the time when linking these pages, their state of legalness has been checked. There haven't been any illegal information or actions at that time. We're not checking the content of those third-party websites constantly without having a particular reason or reference points. As soon as we know about illegal content, we will remove it immediately. Daedalic Entertainment endeavor to observe the copyright of others and to create own content. The content created by this service provider and this website are subject to the German copyright. Content of third-parties are marked. Duplicating, editing, spreading and any exploitation aside from the German copyright need written approval of the particular author or creator. Downloads and copies are only allowed for private purposes. Personal data as names, addresses or e-mail addresses are voluntarily. The usage of our services should be possible without providing any personal data (as far as possible). The usage of contact data provided in the imprint by third-parties to send ads or information which hasn't been asked for, is contradicted. All rights are reserved for the provider of this website to engage legal actions in case of abuse of the contact data to send invalid information, e.g. spam emails. The European commision provides a platform for online dispute resolutions: http://ec.europa.eu/consumers/odr/. Consumers can use this platform to resolve their disputes. We are not in charge or responsible to participate in any dispute resolutions on arbitration platforms.